We're in the midst of the prime driving season. 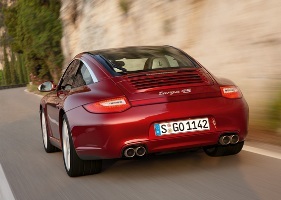 Your region offers plenty of opportunities to enjoy your Porsche and meet other members. This issue highlights our upcoming offerings and provides other news as well, including reports of recent events and news from Porsche. What's happening? German Fest is what's happening. Drivers education too. And a drive to Elkhart Lake to observe a great concours d'elegance and much more. Read on! Drivers education -- July 13 and Aug. 7. Hey. 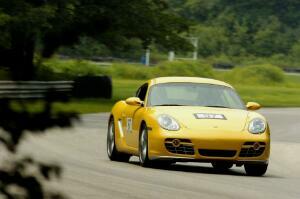 get out and try drivers education in July and August at Blackhawk Farms Raceway. Details about these two events with links to online registration, available here. It's July. That means it's time for German Fest in Milwaukee on the Summerfest grounds. Summerfest officials have invited PCA members to display their Porsches in a special display inside a tent during German Fest. Bring your Porsche down for one or more days of German Fest, July 23 - 26. An RSVP by July 15 is needed to ensure we reserve a parking spot for you under the big tent. Details here. July 5 -- next multi-region autocross event. Details here. July 7 -- Porsche featured at the weekly cruise night at the Harley-Davidson Museum in Milwaukee. No fee involved. Bring your Porsche, park it for a while and enjoy conversation with other members. Details here. July 9 -- Monthly board meeting. (A week later than usual due to 4th of July holiday.) Members are always welcome to pull up a chair, order a beverage or supper and participate in the meeting. Location is Brew City Grill in Mequon, 10250 N. Cedarburg Road, that's highway 57 between County Line Road and Donges Bay. Starting time is 6:30 p.m.
July 18 -- Autocross, Miller Park. Dodgers section of east parking lot. July 18 -- drive to Elkhart Lake in follow-the-leader style from Richfield area. Drive the original street circuit, enjoy an early dinner at the Lake Street Cafe (great dining experience) and then spend the evening checking out the diverse collection of vehicles lining the streets of Elkhart Lake for the Road & Track concours d'elegance. Note, you must RSVP by July 11 to ensure your dinner reservation. Details here. It's not too early to save this date -- Sept. 5 -- for the joint Milwaukee and Fox Valley Region picnic at Porsche Park, Road America. The details for this event are here. Bring a dish to share while the regions cook up brats and other picnic fare. PCA member Jeff Kuklinski has been fortunate to own several Porsches. Read about his passion for Porsches here. Porsche Park keeps improving, thanks to John Guy, other volunteers and a boost from The Kohler Company. Read about the latest improvements here. And remember to park your Porsche in Porsche Park the next time you're up at Road America for an event. It's the place -- the only place for Porsches (other than on the track beating the tires off the competition). The June 13 drive and picnic was a huge success despite a slightly soggy start. Read the report and see some photos here. Autocross results -- multi-region event in June. Bruce Tammi, our region autocross chair, was the sole competitor from the Milwaukee Region in the first multi-region autocross of 2009. Here are the results. Classifieds -- Did you know that the classifieds page is one of the most popular pages on our site? Use it to advertise your items for sale or those you are looking to purchase. Details on how to submit an ad are on the site. Check out classifieds today. You will find ads for wheels and tires; a garage with attached home that is perfect for car collectors; a rental near Road America that is ideal for several people attending weekend events at the track or just to relax and enjoy Random Lake. And more. Porsches capture podium finish at Watkins Glen. Porsche racing news is here. Porsche Automobil Holding SE, Stuttgart, issues nine-month financial report. Details here. Porsche earns 'best new engine award.' Details here.